Secret Valley Cottage - Mossel Bay Area Akkommodasie. 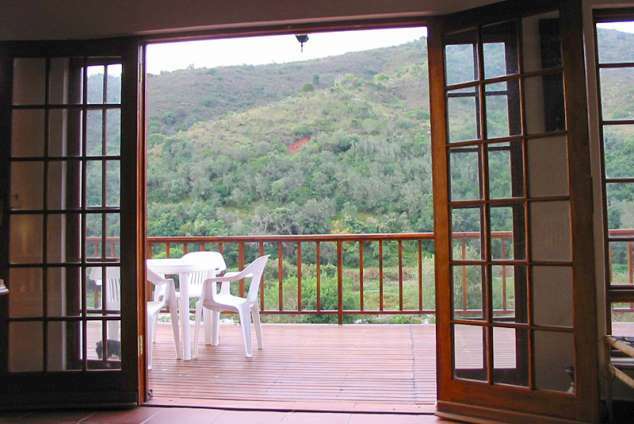 Lemoentuin Cottage is situated on a lovely farm in the Outeniqua Mountains, just 15 km from Klein Brak, Mossel Bay in the direction of the Robertson pass. An ideal spot for nature lovers. Ideal for a group of 4 or family. The cottage has two bedrooms that are furnished with double beds and each room has an en-suite bathroom. The open-plan kitchen is equipped with a fridge-freezer, stove, oven, microwave, kettle, washing machine and dishwasher. The cottage has Wi-Fi and unfortunately there is no TV. The living room opens on a deck that offers stunning views of the mountains and river below. Braai facilities includes a braai on wheel and a Webber. Guests can go swimming, might see bushbuck or birds, including Purplecrested Loeries. It is a short drive, through the “Big Dipper”, to the village of Friemersheim. The nearest beach is at Klein Brak River or drive a little further to the other towns such as Klein Brak River. Oudshoorn and KNKN is a 45-minute drive. Famous restaurants in the area are Eight Bells and The Village (Owned by Botlierskop). 116 besigtings sedert 22 Mar, 2019. Laas opgedateer op 17 Apr, 2019.